Quick Overview More oxygen, unfair advantage Dynamic gradient compression increases oxygen-rich blood delivery to muscles and gives you more power and endurance Glide through the water Sleek heat and pressure treated TRI400 fabric minimises drag Unrestricted movement Thanks to a Memory MX Triweb panel down the spine and around the obliques Detailed description Wasting valuable seconds during transition isn't an option, so pull on a SKINS TRI400 men's sleeveless top and push on into the next stage. Dynamic gradient compression helps accelerate your blood flow to get more oxygen to your active muscles. Increased circulation helps reduce lactic acid build-up – so you can compete hard from start to finish to smash your previous PB. 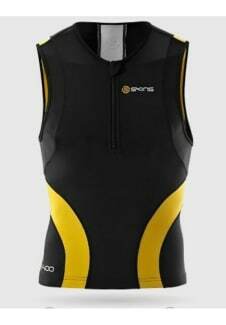 Based on 400 key fitting points, the SKINS TRI400 range is cut for swimming, cycling and running comfort. Strategically placed panels of TRI400 fabric minimise drag and aid performance in the water.